Are you looking for all the Respiratory Therapy formulas and calculations that you need to know as a Respiratory Therapy student? If so, then you’re definitely in the right place! You can use this study guide to practice and get the hang of all the math equations and formulas that you will possibly see throughout the Respiratory Therapy program at your school. On top of that, the information and practice questions found in this study guide can help you prepare for your exams in school, as well as the TMC Exam once it’s time to start preparing for boards. Even though we may not like it at times (because I mean, who does like doing math? ), we still must know and understand each of these equations and formulas if we want to succeed in Respiratory Therapy school. That is why it’s important for you to go ahead and learn each and every one of these respiratory therapy formulas and calculations now, so when the time comes, you’ll be good to go! Are you ready to get started? 🔒Click Here to get access to our FREE Cheat Sheet with all the best Formulas and Calculations. I:E Ratio given both I time and E time are given Divide both sides by the Inspiratory time. CD dynamic compliance, aka CLdyn, norm is 0.03-0.04L/cmH2O (30-40mL/cmH20), calc is Vt(L)/(PIP-PEEP) Changes in CD indicate changes in CL or elastance. Up with decreased elasticity (emphysema, down with with stiff (ARDS). *Ct Tube compliance aka compressible volume, volume lost to pt circuit, approx 3ml/cmH20 x PIP, deduct from VT to find actual delivered tidal volume. VT-(PIP x 3) equals actual VT.
CvO2 (Hb x 1.34)SvO2 + (PvO2 x .003) norm is 15 vol%, represents the value of O2 in blood returning to the right side of the heart after tissues have oxygenated. Flow required for a 1 second I-time and a VT of 750cc? .750 equals L/sec x 1 or .750L/sec flow. To convert to L/min .750 x 60 equals 45L/m, this is the vent flow setting to deliver a VT in 1 second I-time. PaCO2(d) CO2 desired, CO2 is adjusted by changing Resp rate so (VExCO2)/CO2d=VEd or (RRset x CO2)/CO2d=RRd, always round down and go slightly acidic as tissue will oxygenate better. RAW (RIAF) Airway Resistance norm is 5-12cmH2O/L/Sec for intubated pt, (PIP-Pplat)/(flow in min/60 sec). Increase in RAW reflects an issue with airways, bronchospasm, secretions, edema etc. TC Time constant, (Raw x CS)e, where e represents volume exhaled as a percent, 1 is 63%, 2 is 86%, 3 is 95% and 5 is 100% exhaled. TC <3 leads to air trapping. VO2 O2 consumption, norm is 250mL/O2/L/min, [C(a-v)O2 x QT] x 10, the amount of O2 consumed by the body per liter of blood per minute. VTspont VEtot-(VTset x RRset)/(RRtot-RRset) Measured when machine in SIMV mode, represents what the patient is actually breathing on his/her own. VT norm is 5-8 mL/kg (400-600 cc), <5mL/kg indicates support, >5 weaning. Pack years= # of packs/day x # of years smoked. Amount of drug in mg. Drug% x 10 x mL= number of mg in 1mL of the drug. So there you have it! That wraps up our massive list of most of the formulas and calculations that you will see in Respiratory Therapy School. You can go through this list to practice learning all those pesky math equations that you must know in order to succeed in RT School. 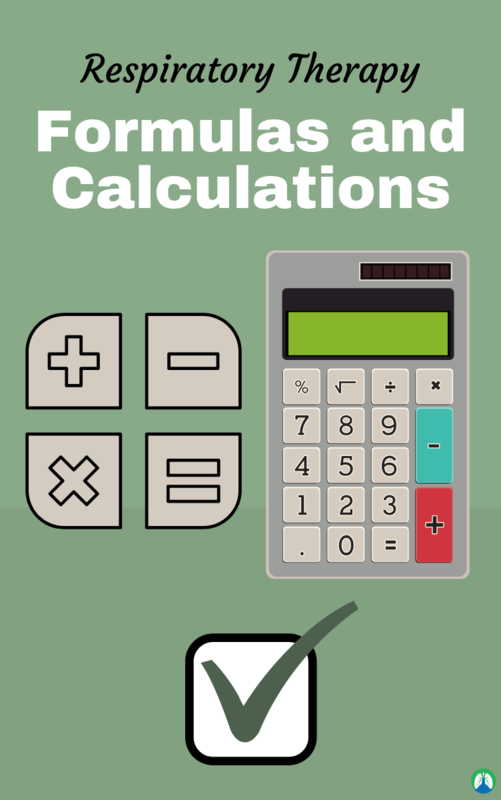 Also, feel free to bookmark this page so that you can use it as a reference for every time you get stuck on one to the formulas or calculations, you can use this guide to help get back on track. And be sure to download a copy of our FREE cheat sheet that breaks down the formulas and calculations even further. Particularly, the ones you need to know for the TMC Exam. All the formulas and calculations that you need to know for the TMC Exam. Need Help With Your Egan’s Workbook? We Got All the Answers!